It might sound strange, but I was looking forward to this day. 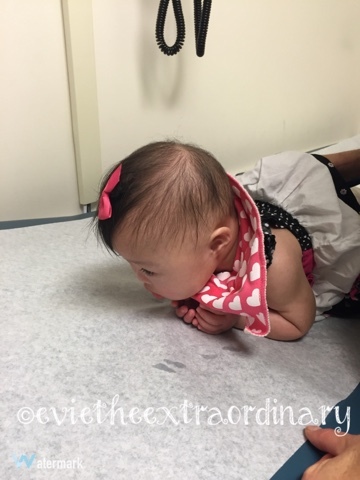 This was Evie's first visit to the Down Syndrome Clinic at Boston Childrens. 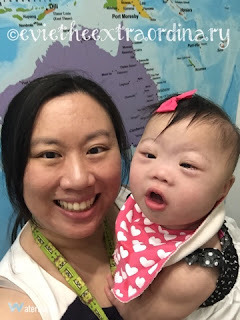 When we found out about Evie's extra chromosome at 10 weeks prenatally, we learned quickly that there was a Down Syndrome Clinic at Boston Childrens (there's also one at Mass General). We met with Dr. Emily Davidson, the director of the clinic, and were very much reassured by our visit. We checked in at 8:30 am and I was so happy to see other kids there playing in the waiting room. Look, Evie, I wanted to shout, there are other kids like you! Each one so unique! I felt a certain kinship with everyone there even though we didn't say much. Parents just smiled at each other. Angela, the longtime coordinator for the clinic, orchestrated where each family went. She has a son with Down Syndrome, and he just started college this year! The first stop was Height and Weight. Evie was 26" and weighed 16 lbs and 7 oz! Physical Therapy was our first appointment. The PT played with Evie and assessed her in different positions. Evie was very vocal about what she did and didn't want to do. Her favorite position is tummy time with her hands folded in a praying position. Very proper, my girl is! She does not like working muscles that she's not used to using. Basically Evie is coming along very nicely. We learned that we can work on having her grab things more with two hands and practice transferring objects between hands. Also grabbing for things above her and off to the side are skills we will have to aim for. I think she's close. Seems like maybe she will sit on her own in 1-2 months too at her current rate! This mommy is ecstatic thinking about how photos would drastically be easier to take of Evie could sit up on her own! The pediatric dentist was our next stop. I was very impressed with her. She was extremely professional and knowledgeable. Erick and I both swabbed our gums and gave samples to find out in a couple weeks if we have more predilection towards cavities, because apparently the bacteria we have can get transferred to Evie when we kiss her. That is so interesting! We got a toothbrush and her first toothpaste, which will be ready for use once her first tooth pops up. The dentist said it would be a little while longer for teeth for Evie. In the meantime, she is a drool monster. "Drool monster" means Mommy shops for drool bibs! Someone asked where I get Evie's drool bibs, so I thought I'd share a link. The feeding/speech pathologist was next. We already see one at Childrens, but it was nice to check in with someone else to see if we could learn anything new. She saw Evie NOT take the bottle, and do the turning of the head into my armpit. We talked about the straw box and the sippy cup. She encouraged me to give the sippy cup another try. I can say 3 weeks later that this suggestion changed our lives. Evie drinks more out of the sippy cup than she drank in the bottle, and we are averaging more about 30 ml of formula, as compared to before maybe 10 ml if we were lucky. Yay for Tilty cups! Nutrition was next. We already have a nutritionist in the GI clinic, but it was nice to hear a second opinion and confirm that we were doing a good job. 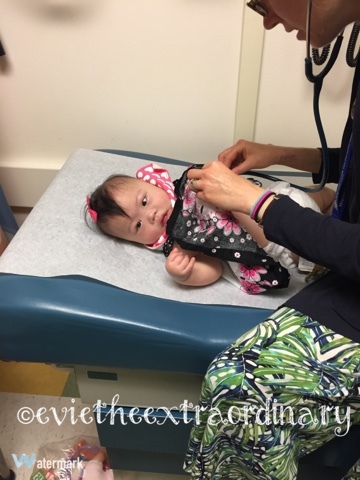 Evie's growth curve always impresses the clinicians who see it, because it just follows the curve so nicely. The only dip this whole time was when she had heart surgery. This is in stark contrast to when we were in the NICU when she was born, and every ounce she gained was a victory. Next we had a break while waiting to see Dr. Davidson. I was impressed with the foresight about when Evie would be in each part of her visit. They like to make the most of the babies' awake time and get them through their appointments before the conk out from the long morning. Dr Davidson took us in and examined Evie, who was miraculously still awake. She ran through every specialty to make sure that we were well taken care of. Evie has decided she really likes exam tables. She likes to do tummy time and drool all over the paper, leaving her mark(s). And that was our fun morning at the Down Syndrome Clinic! We felt well cared for and like we had just joined a big family. Thank you for such a nice visit, Dr. Davidson, Angela, and team!